Let’s start perusing the Persian nooks and crannies of cyberspace in part #4 of Internet: Persian Style series! 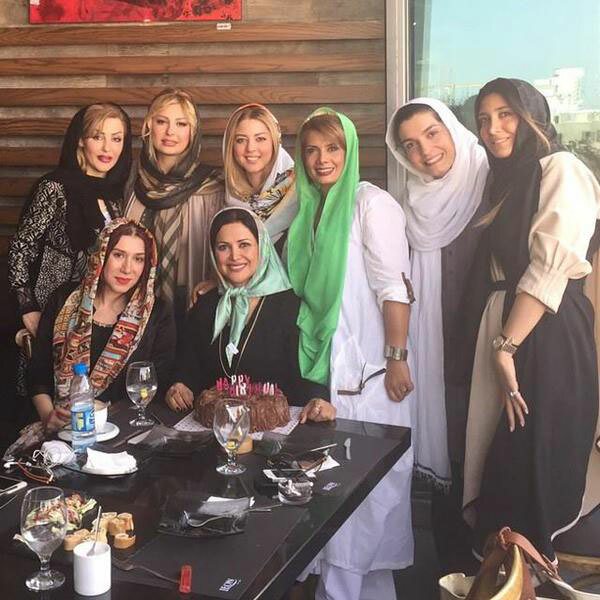 with this fun photo of a group of Iranian soap opera actresses gathered for a birthday. The photo was posted on Twitter by @Sidewalk Lyrics (love all of her wonderful postings! You should totally follow her) who quipped thusly: “There’s more botox than cake.‬” Ha ha! But … I mean, I don’t know … maybe I’ve become desensitized by the Kardashians and Hollywood actors like Mickey Rourke et al, but these ladies (except for one glaring exception, ahem) look pretty normal to mine eyes. What do you think? Way too much botox? By the way, I had no idea there were Iranian soap operas! How fun! By another way: I’ve never had botox but I’m considering it. I am considering it, child! If you can’t beat them inject yourself with botulism toxin and join them. Or something to that effect! This is too funny and entirely awesome! Iranians (Persians) are big on serving fruit when expecting guests. The fruit is washed and arranged artfully into a pyramid shape on a serving platter. I have to say this is one of the most delightful arrangements I’ve seen so far and I have seen my fair share of Persian-style fruit arrangement. I love how the hosts used grape leaves in the bottom layer. Such a lightheartedly tasteful and creative touch! Oh this is a funny vintage ad I found on Facebook. I’m guessing it is circa late 1950’s or early 1960’s. It’s an ad for hairspray with the brand name of “Taft” which was so popular that it was the generic term for hairspray. And let’s end round #4 of our Persian Internet odyssey with this shot of office workers in an Iranian startup company. There’s a surge of tech-savvy entrepreneurial enterprises in Iran, apparently. Which: cheers and hip hip hooray for progress. Until we meet again, I bid you a fond farewell and I remain your chaker va mokhles and abd va abid blogger. Hi. I’m an old subscriber. I can’t see any pictures in this post except for the first one. Anyone else having this trouble? It was like that in the last post as well. Not fair! Your posts make up my day. Oh Shazia jaan, I’m so sorry about the problem! I can’t imagine what might be the cause but I’ll look into it! Question: so you only see the first image even when you’re on the website page? Or just when you get the email notification? Ha ha, yes, isn’t it funny that we fuss about how to arrange fruit. I kind of love it though!